THE NAVIGATION TOOL TO HISTORICAL PAGES ON THIS WEB SITE ARE AT THE TOP OF THIS SCREEN. THE SITES ARE "TLSN", "SPORTS", "GUEST WRITERS", "MISSIONS", "ARTICLES" , "LOST TOO SOON", AND "SENTRY". 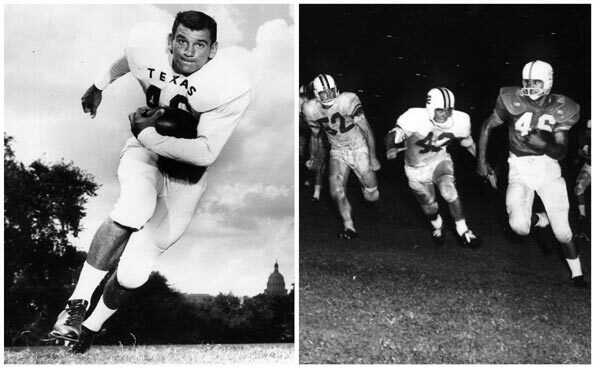 Accomplishments of these athletes are a reminder to all Longhorns that In sports and far beyond, their contributions to Longhorn heritage shape the present and empower the future. Well look what showed up due to a job change by my daughter Linda Lotz leaving Austin. Cleaning drawers & closets out can reveal all kinds of surprises. Thanks to her, I can honor a great friend & football player Ken Ferguson, almost on his birthday of April 18,1941. Ken passed away 6 years ago on July 5, 2012 but not before he touched many lives and was a strong role model for young men as their coach. I have many memories of him on the football practice field & in game conditions but the one memory that sticks out was in the summer of 1959. The University of Texas got us jobs with the Southern Union Gas Company but it was in Farmington, New Mexico. We packed up & headed West. Upon arrivial we were given a large truck loaded with 7 foot poles/pipe with instructions to mark each mile on this gas line between Farmington & Albuquerque, N.Mex with the pole buried 3 feet in the ground & paint on the pole what mile it was on the gas line and drive to the next location The company only paid for 40 hour weeks, no overtime, so that summer our days were long getting to & from our next pole marking that we usually had Thursday & Friday off. We "ventured" together all over that part of New Mexico & Colorado and one long weekend we drove to Midland, Texas to visit with MY girlfriend, Ann Massey. Her parents moved there right after Ann graduated. Ken Ferguson was a saint, never losing his temper, unlike his "mile marker mate", always level headed and the main reason I survived that summer job. RIP Ken Ferguson and thanks for the memories. If any of my WHS/UT friends have fond memories of Ken, please share below.